So, yes, it has been a mighty long time. I wish I could say I followed up that last post with an extended honeymoon in Europe with the Woman Formerly Known as Goose and Never to Be Referred to as My Wife. (Don’t worry — I’ll stick with WFKG as the abbreviated nom de blog for the person to whom I am legally married. She likes sounding like a radio station.) Not surprisingly, our impulsive mid-semester nuptials were followed not by an exotic trip but by the long grind of wrapping up an academic year, a busy, fraught period made especially so for me this year because I was preparing to step down from an administrative position I had held for twelve years and, as it turned out, getting ready to move into a new and substantially bigger administrative position. I start the new job on July 1, but I’m already up to my eyeballs in transition work. The long, languorous summer of 2014 has suddenly turned into a frenetic season of enormous changes at the last minute. I’m excited but still not sure how to blog about most of what is happening, so let’s just talk about the basement, okay? I’ll figure out the other stuff later and get back to you. In less than three months. I swear. My study is in the basement. It is a ridiculously large study, because it is the space underneath the great room we added to our humble red brick cape cod during the We Must Be Crazy Renovation of 2003-04. If the first-floor room is a great room, I’ve always thought the basement space should be called the fabulous room. It’s everything you don’t expect a basement to be: light and open and vertically spacious enough that a tall girl can do sun salutes without worrying that she’ll scrape the ceiling with her finger nails. It can be chilly, but we have a cute little Norwegian stove that can produce an astonishing amount of heat when necessary. Sliding glass doors open out onto a patio, which leads out into what fancier people would call the garden and what the neighborhood deer refer to as the hosta bar. I love my study, but the truth is I’ve neglected it a lot in the last few years. With two different offices on campus (one in my department and one in the program I directed), I didn’t get to spend much time there. The shelves were lined with books I hadn’t looked at since grad school, and every available surface was slowly covered up with stacks of files and papers and memos that I was too lazy to file and for one reason or another reluctant to throw away. Paperless office? Ha! Not mine, kids. 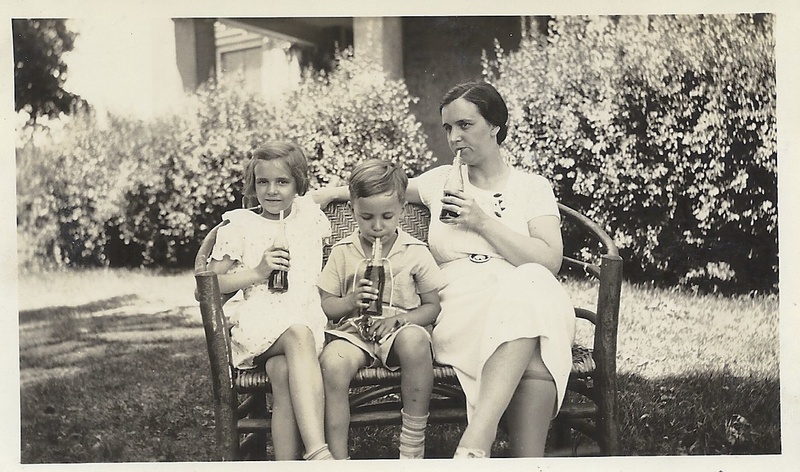 Le père de la folle, drinking a Coke, probably in southern Indiana, c. 1935. I adore this picture, mostly because one of my favorite things about visiting my grandparents when I was a kid was that the basement stairs were always lined with cartons of Coke in glass bottles. It’s nice to see that the penchant for sugary beverages was deeply rooted in family history. Why do I bore you with the mundane details of my tossing out and burrowing down and looking back and moving forward? It’s a way, I suppose, of explaining the recent silence here without divulging the details of months that have been stressful, challenging, and in some ways momentous. Cliche as it sounds, facing the mess in the basement was an important part of ending one chapter in my professional life and preparing to begin another. Going through all that paper was an opportunity to reflect on what the last decade or so has been and meant — the students I’ve known, the books I’ve taught, the meetings (oh, lord, the meetings!) I’ve attended, the plans I’ve made and in some cases unmade. The taking stock felt good. It was a way of honoring the recent past, but it was also a way of letting it go. That felt good, too, liberating even. I step into my delightfully uncluttered study now and feel energized rather than overwhelmed. Clean up, let go, move on: One office down, two more to go. How are your summers going, Madpeople? I hope you’ll stop by to say hello to me, though it’s been such a mighty long time. Shoo-bop, shoo-bop, my baby. Throw something out today. I promise you’ll feel better. Oh I love a good organized room. Of course, it happens so rarely around here… I admire you for getting one “office” cleaned up and happy! And congrats on starting fresh with a new job. Summer is going well for me for the most part. I’m trying to make this “the summer of mucho writing.” So far, so good. A Coke toast to my favorite lost blogger! Nice to see you emerged from the decade of paper in your home office! You’re discouraging me. Betty and I are preparing for our own We Must Be Crazy Renovation, which will entail moving completely out of our house. Last weekend, I boasted that I could pack the entire house up in a week . . . . yesterday she took me up on that foolish offer. Your blog makes me fear that the I will be buried in the Crazy shortly into the packing . . . . and sorting and discarding that I pray to God it will entail. I pray to God because my beloved is a total Packrat who still has ID badges from her 1970s job with the City of New Haven in her dresser drawer. If Betty the Packrat is letting you do the packing, then you get to throw out anything you want. Just keep the liquor nearby. Good luck with the You Must Be Crazy Renovation. You are, but it will be worth it in the end. Ten years later, we still love every moment of living in the house our craziness rebuilt. I love the seriousness with which your father is drinking his coke. Your clearing is inspiring. I manage well with chaos, but I’m trying to get rid of stuff. I did buy a two sided scanner so I could scan old files (for every class I’ve ever taught) and financial stuff. Fortunately, I now get almost all of that electronically, so instead of a large *box* of paper I have compact file folders. But each year I need to remember to shred one year, and I don’t. One of my less academic goals for my sabbatical is to reduce a large lateral file cabinet to zero. Instead of the administrative work I’ve been doing on campus, I’ll make that administrative work part of my day. I think if I work from about 4-5 two or three times a week, it will happen. I have been unwell. I believe I had been slowly getting unwell for some time only to hit a really low spot between February and now. So learning what was wrong was the first step to getting better. Editing my ambitious summer plan is the second step. I’m fortunate in that I was able to hire Eldest (available this summer as she is taking a summer course that messes up other employment options) to work in my office, shredding old student paperwork and weeding out my files. My home office (hah! the filing cabinet in my bedroom closet, I mean) is next up although I’ll likely tackle that myself while Eldest continues to work her way through the mountain of material at the university. Congratulations on getting so much of your paperwork wrangled so that you can appreciate all that you have done and ready yourself for the challenges that await! I’m so sorry you’ve not been well, Janice. I hope the summer is a healing time. Glad to hear you’ve got some assistance on the office organizational front. It’s a huge, daunting job, but tossing out is satisfying, even (perhaps especially!) when someone else does it for you. Take good care. Why so coy about the nature of your new administrative position? Sounds like some kind of deanery?? That’s a good question, Physio. I’m not sure why I felt the need to stay a little vague in this post. I think I’m still sorting out how blogging will fit in with my new role, which is not (thank dog) some kind of deanery. (No disrespect to deans and deanlets. It’s just not my thing, I think.) No, I’m becoming executive director of a great big (2000 students) living-learning program for academically talented freshmen and sophomores. It’s a very cool program that emphasizes intentional community, service, and interdisciplinary learning, and I’m hugely excited about the prospect of guiding it. I’m sure I’ll have more to say about it down the road. Thanks for nudging me to be a little clearer, at least in comments.